Looking to Mix and Match? You can buy our antibodies and blocking peptides as pairs. Show me Antibody and Peptide Pairs! On Western blots, you might sometimes see non-specific binding of an antibody to proteins other than the antigen. This shows itself as multiple bands rather than the 1 or 2 bands you expect. In general, this is more common with polyclonal antibodies, but you sometimes see it with monoclonals. When this happens, it's really important to work out which band or staining is specific to your protein. You can do this by carrying out an immunising peptide blocking experiment. Before you can run the staining protocol, the antibody has to be neutralised by incubating it with an excess of peptide that corresponds to the epitope recognised by the antibody. These peptides are called blocking peptides. 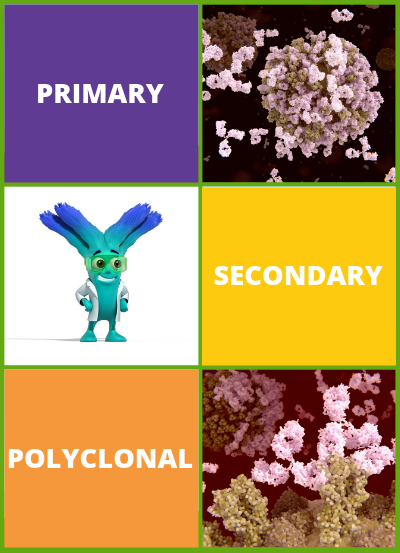 Blocking peptides are the peptides used to raise the original antibody, particularly in the case of polyclonals. You can buy the antibody and the blocking peptide together, as a pair. The antibody that is bound to the blocking peptide is no longer available to bind to its epitope in the protein on the Western blot or in the cell. The neutralised antibody is then used side-by-side with the original antibody alone, using the original protocol, and the results are compared. By comparing the staining from the blocked antibody to that of the original antibody alone, you can see which staining is specific. Staining patterns or bands from the blocked antibody will be absent from the Western blot or immunostaining performed with the neutralised antibody. Select our most popular matching peptide pairs below.